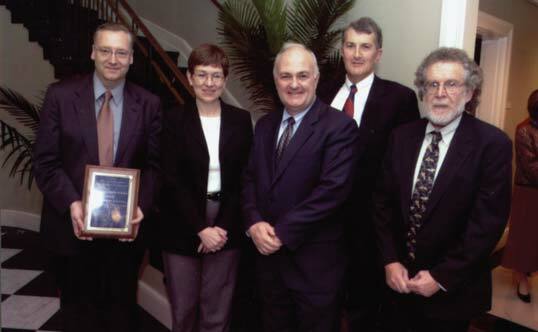 Dr. Carol Kovac (second from left), general manager of IBM Life Sciences, presented an IBM Life Sciences Institutes of Innovation award to Johns Hopkins University at a ceremony in Clark Hall in November 2003. Hopkins participants were (from left) Raimond L. Winslow, director of the Center for Cardiovascular Bioinformatics and Modeling; Steven Knapp, provost and senior vice president for academic affairs; Andrew S. Douglas, interim dean of the Whiting School; and Murray B. Sachs, director of the Whitaker Biomedical Engineering Institute. Computing power that used to fill a room can now fit in the palm of a hand. But not all of today’s computational challenges can be met by equipment that can fit in a hand, or even on a desktop. Those involving vast amounts of complex information require leadingedge supercomputers with extraordinary processing capabilities. Thanks to the IBM Corporation’s recent gifts, the Center for Cardiovascular Bioinformatics and Modeling (CCBM) at the Whitaker Biomedical Engineering Institute now has the powerful computers it needs to create multi-scale computational models. These models, ranging from the genome and proteome to single cells and the whole heart, are expected to lead to important breakthroughs in the understanding of cardiovascular disease and to the prevention, diagnosis, and treatment of heart problems and other human disease. Whiting School researchers and their colleagues at the Johns Hopkins School of Medicine will be using the powerful information systems being built to understand how genes and proteins interact to influence heart disease, and to target treatment solutions. IBM also awarded the CCBM a Shared University Research (SUR) Award for its ongoing work in mathematical and computational life sciences and informatics. 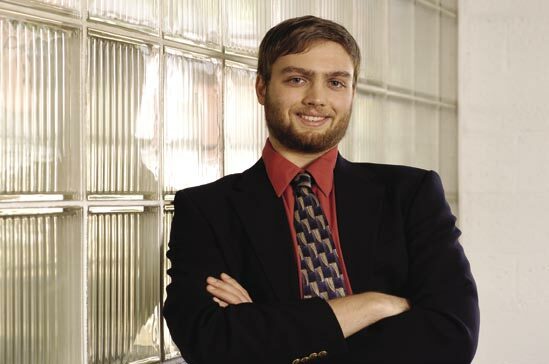 CCBM’s director is Raimond L. Winslow, who in 1998 created a virtual heart that could simulate cardiac arrest—very useful in researching lifesaving drugs. 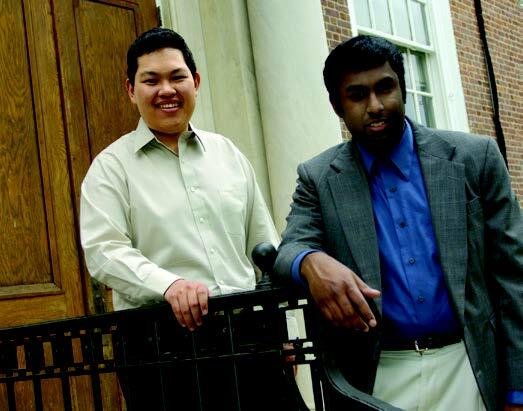 A professor of Biomedical Engineering, Winslow also has joint appointments including those in the Whiting School’s departments of Computer Science and of Electrical and Computer Engineering. The SUR grant will fund equipment and graduate fellowships in Winslow’s programs at the Whitaker Institute. Dr. Carol Kovac, general manager of IBM Life Sciences said, “When we first talked about innovation institutes, we decided that we would build on longstanding collaborations. This institute is founded on a real intellectual and scientific collaboration between JHU and IBM.” She spoke at the ceremony held in November 2003 at the Whiting School’s Clark Hall to present the Institutes of Innovation award. The SUR award will provide CCBM with technology that can simulate complex and highly detailed models of heart cells, tissues, and organs, and seek variations in gene expression during disease states. Researchers expect to gain insights that could lead to new, more effective drugs for treating heart-related illnesses and to novel approaches for the understanding, cause, diagnosis, and treatment of other human diseases. IBM funds about 50 SUR awards a year, collaborating with institutions worldwide. In the process, it facilitates valuable connections among top researchers in academia and industry.